When you work with Rhodes & Williams, you’re in total control. We’ll consult with you on all your insurance needs in person, over the phone, even email if that’s what you prefer. Our brokers share a philosophy of providing our clients with personal, hands-on and highly responsive service. Put your Rhodes & Williams policy at your fingertips, for whenever you need it. 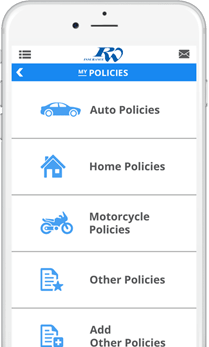 Our customized app lets you view your policy details right from your smartphone, manage your account and more.